You are currently browsing the Acid909 blog archives for August, 2013. D.A.V.E. The Drummer and the rest of the SUF crew, she has been instrumental in the birth and development of the underground Acid Techno sound that is unique to London. As the SUF artist bookings agent as well as an ex-employee of Kinetec Records, Rachel knows everything there is to know about acid and techno and has played events all around the world, be it underground or over-ground. In 2004 she collaborated with US DJ, Sarah FAB to create The Vinyl Vixens. Originally an all-female DJ agency, the Vixens transformed into the pair just using the name, but keeping the ethos. Flying the flag for quality female DJ’s. She has had numerous records released with fellow SUF artists including Ant and Guy McAffer. Spliffy B started DJing at squat parties in 2000 around Dorset and Hampshire. He then started playing in clubs in 2002. Between 2002 and 2008 Andy was playing in various places mainly in squat parties around UK. In that time he did play a few sets in Germany, and Belgium. In 2004 Spliffy B amongst other events he was promoting he promoted DNA with DJ Slimz. Between 2008 and 2011 due to personal reasons he only played a few sets, one of which was on Weymouth Beach. In 2011 he played a set in Holland. Since then Spliffy B has started promoting and DJing again. Spliffy B is currently a resident of yes yes y’all which is Readings premier UK hip hop event. He also promoted and played at liquid filth in august 2012 with Slimz, DJ Fiber and MiNoR cOnFuSiOn. Spliffy B has supported several big name DJs. Acid909 want to say a massive thankyou to all the DJs who played the 2nd Acid909 event. Especially to Steve Mills from braingravy who put on an absolutely fantastic set and Miro who also dropped a bangin set! We also want to say a big thankyou to Ryan for supplying the sound and to Jacky D and Spliffy B for playing some awesome sets too. The people we want to thank more than anything else were the ravers. If it wasnt for you guys it wouldnt have been such a huge success. The feedback we got was fantastic. After the huge success of the last event we are now going monthly as of next year on the 1st saturday of every month. This is an event that is already going from strength to strength and getting bigger and stronger! We hope to see you all there for the next event where we will have Rachel Rackitt from Stay up forever there. This is not to be missed at £5 entry. 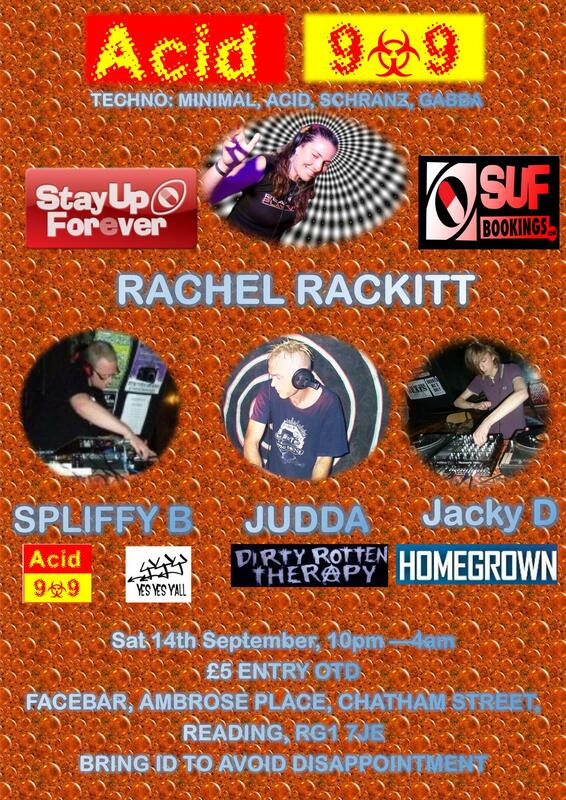 This time we will have Judda from Dirty Rotten Therapy back, Spliffy B from Liquid Filth, Acid909 and Jacky D from homegrown. The sound will be supplied by the awesome hardparty sound system. This acid techno event is NOT to be missed!